Before I do the formal review, I just wanted to say that nobody should be taking Woo Jin's psuedo-drama-psychology at face value. I've attended a talk on human deception by a former criminal investigator, and she entirely debunked common myths like liars have poor eye contact or that liars will tend to look to the left. In fact, evidence suggests that liars are more likely to make direct eye contact. So take what you see with a massive grain of salt, because people who lie aren't always going to be so obviously squirming in their seats. That said, while I generally enjoy this drama (it's the only one I'm following right now, as you can tell from the LG-centric posts recently), I don't think it's anywhere near as good as the hype warrants, plus there's some pretty big frustrations I have with the handling of this. Perhaps those new to this story are able to better enjoy the shock factor and therefore remain highly impressed, but I often find my attention bleeds away during the hour-long episodes. These past two episodes reflect that. The Reinstatement Game was fairly well-adapted relative to the previous games, but for some reason I had a harder time buying the base premise for this game, and am far from infatuated with any of the characters. If you read comments on this show these days, you'd think Ha Woo Jin was the hottest piece of meat alive from all the fan worship and love comments. Clearly I'm in the minority, but I only somewhat see it. I get that he's the conventional cold and smart leading male, which is normally 100% my thing, but I'm held back here by the continually forced acting as well as some seriously awkward behavior. Number one on the awkward list is the repeated shoulder grabs, which are purely fan-service and really make no sense for either the plot or his character. 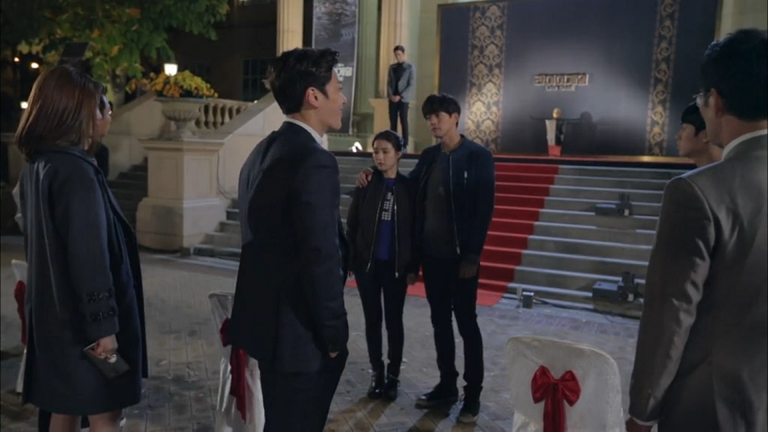 Seriously, next time he does that, can we at least have Da Jung do something besides just widen her eyes and stand there with complete passivity? I know you're meant to be the innocent and good heroine, but that doesn't mean you should just let a guy grab you whenever he feels like it, and without any reciprocation if you're into it. The sameness of this motion (now the third or fourth time it's been played up) is starting to feel stale. Number two here was the laughably embarrassing dog comment, which obviously has lots of lady viewers in a tizzy but which made me cringe both while watching and reading about after. I get what the writers were going for - showcasing his ferocious, possessive manliness - but to me it came off more self-demeaning (Akiyama would never parallel himself with a dog), random as hell, and just cringe-worthy. You're here to help her because you're secretly a nice person and she reminds you of your mom, you're not here to serve as her slave or pet, and to state it like that is a sheer perversion of his motivations. Given my rants from before, do I think Lee Sang Yoon has improved? Yes, he undeniably has settled better into the character. 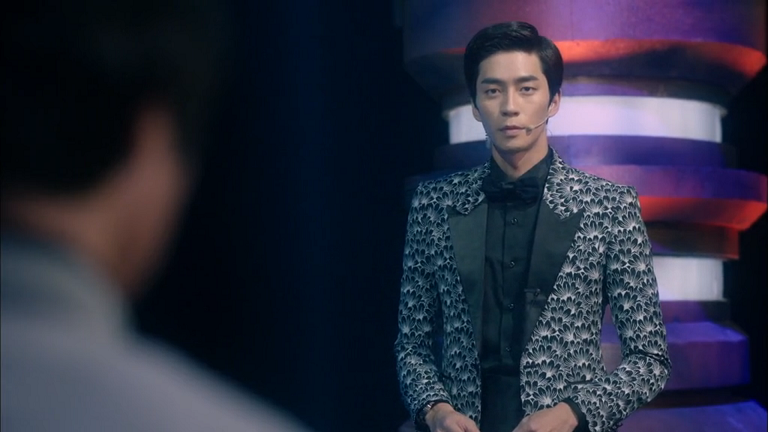 But do I think he's convincing as Woo Jin? Still no, because there's this sense of artifice in his delivery and glower. When I watch, I feel like his glares, dramatic exits, and general mopiness are all for show rather than a genuine reflection of the character. Maybe it's my prejudice from the early episodes speaking, but I'm left scoffing at some of his moody outbursts outside of the game setting. I can understand why other people like him, but for me it's not quite working. I also want to comment that Do Young is similarly not impressing me. He's such a bundle of cliches as a villain, all smoky background and uncertain motives. I'm pretty sure that he's the K-drama version of Yokoya, since much of his behavior has been copied over from the canon character. As for the plot of episodes 5-6, Reinstatement / Restructuring Game has always seemed wonky to me. I'm not convinced that a rational group of people couldn't figure out the simple solution to overcoming the massive Da Jung points collection issue. The simplest solution for them is to sit out and let her default on her commitment to pay $150K at the end of the round, which would naturally result in her loss from the game (and therefore save all of them). It's not that hard! 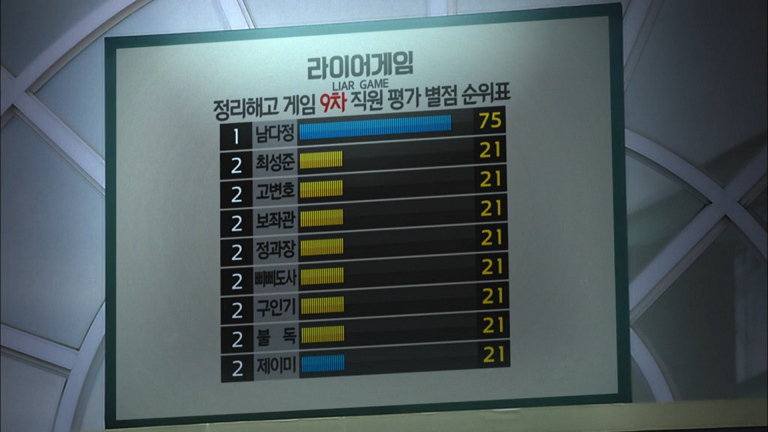 And regarding the risk of someone else secretly buying stars, 1) since they're all tied with a guaranteed loser next round (Da Jung) there is no advantage nor risk in not buying - 7 people would have to make a move before you're forced to, and 2) they have the contracts, did they forget? Just write a contract saying you won't buy stars, problem solved. Not to mention, Da Jung and Woo Jin were sitting in a single place the whole time for the sales. If I were them, I would head over as a group and sit there guarding against any individual's sales, rather than going individually to buy (and thus allowing massive price discrimination). I can't correctly recall the J-drama's handling of this issue, but I think there was another catch that made the behavior seem more rational. Or maybe it's just one of those things that requires major suspension of disbelief. Adding on the freaking retarded Jaime card game (which I'd hoped they would cut out, but nope) and you have one of Liar Game's least clever moments. I'm just awaiting the Contraband Game which at least rationally should be better, but which is also much longer. To be honest, I think I might have to put aside this drama, because watching it has been a lackluster experience so far. It's good that others are enjoying it, but I'm left unconvinced and skeptical more than not. Maybe it's time to go back to a no-brainer rom-com where I can turn my brain off and not question half-drawn logic / motivations. I cringed reading what you wrote about Woojin. 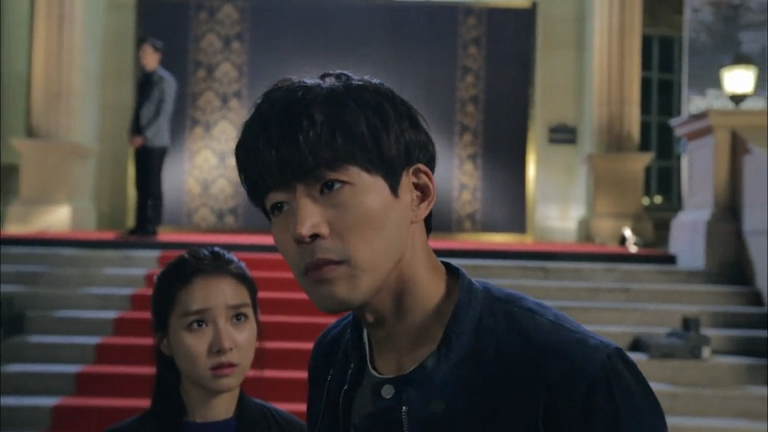 The more I see Lee Sang-yoon's screencaps, the more I'm convinced he'll never be Akiyama or even a facsimile of him. It just sounds like Woojin is your typical cold k-drama hero who's prone to wrist-grabbing and snarling (but the right woman will melt his crusty exterior!). Jeez. Akiyama was almost always cool and collected. I can't believe Doyoung is the k-version of Yokoya, eeeee. I don't like this change. As for the Restructuring Game, I just rewatched the episode and it could probably be that the contract was written such that they have to sell Nao 10 each of their votes - if they just sit back and let her default, they would also have to pay the penalty because such a contract is valid and they can't back out of it or they'd end up with more debt. If they buy back the votes, it needs to be at whatever amount Akiyama said was necessary to help Nao counterbalance the debt, so that nobody will be making a loss. Also, one of the players tried to amass enough money to pay off his debt even if he came in last, but Akiyama trumped him by telling everyone else so nobody would buy his votes - the guy was forced to go to Akiyama to buy votes to make up for the deficit instead. I don't know if I'm reading it right because this game confused the heck out of me. I think I just sort of went along with it cuz Akiyama was so cool and shrewd throughout, haha. I think once Akiyama pointed out that everyone else needed votes to be in the safety zone, they pretty much lost their heads and had to buy to make up the deficit. 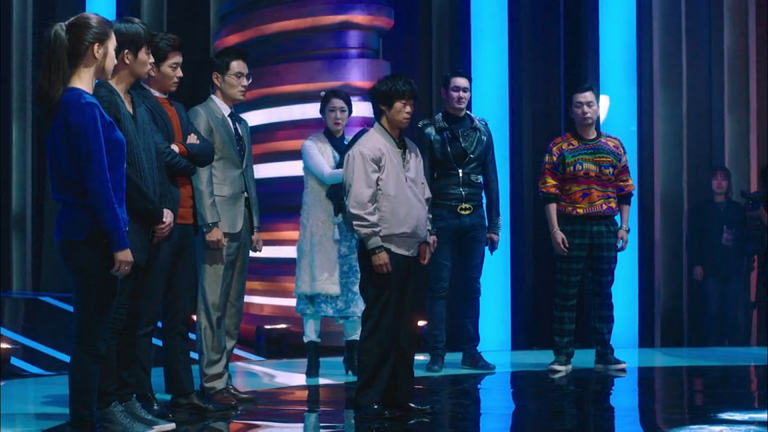 Anyway, I look forward to your review of the 2nd Liar Game film! That's right, I think there was a minimum point threshold in the original premise. The only part of restructuring game I remember is Akiyama sitting there looking terrific while telling all the players to start buying haha (kind of want to rewatch it just for that). Unfortunately my review of the second movie isn't too positive (really couldn't stand the girl as mentioned), but it was an interesting reimmersion in the LG world. It actually made me appreciate some elements of the Kdrama, like the less ridiculous character behavior. But the Japanese series still reigns supreme, and I probably will rewatch it soon.